One of the morbidly fascinating aspects of climate change is how much cognitive dissonance it generates, in individuals and nations alike. The more you understand the brutal logic of climate change — what it could mean, the effort necessary to forestall it — the more the intensity of the situation seems out of whack with the workaday routines of day-to-day life. It’s a species-level emergency, but almost no one is acting like it is. And it’s very, very difficult to be the only one acting like there’s an emergency, especially when the emergency is abstract and science-derived, grasped primarily by the intellect. This psychological schism is true for individuals, and it’s true for nations. Take the Paris climate agreement. In Paris, in 2015, the countries of the world agreed (again) on the moral imperative to hold the rise in global average temperature to under 2 degrees Celsius, and to pursue "efforts to limit the temperature increase to 1.5 degrees." To date, 62 countries, including the United States, China, and India, have ratified the agreement. Are any of the countries that signed the Paris agreement taking the actions necessary to achieve that target? No. The US is not. Nor is the world as a whole. The actions necessary to hold to 2 degrees, much less 1.5 degrees, are simply outside the bounds of conventional politics in most countries. Anyone who proposed them would sound crazy, like they were proposing, I don’t know, a war or something. So we say 2 degrees is unacceptable. But we don’t act like it is. This cognitive dissonance is brought home yet again in a report published in October from Oil Change International (in collaboration with a bunch of green groups). It’s about fossil fuels and how much of them we can afford to dig up and burn, if we’re serious about what we said in Paris. It’s mostly simple math, but the implications are vast and unsettling. 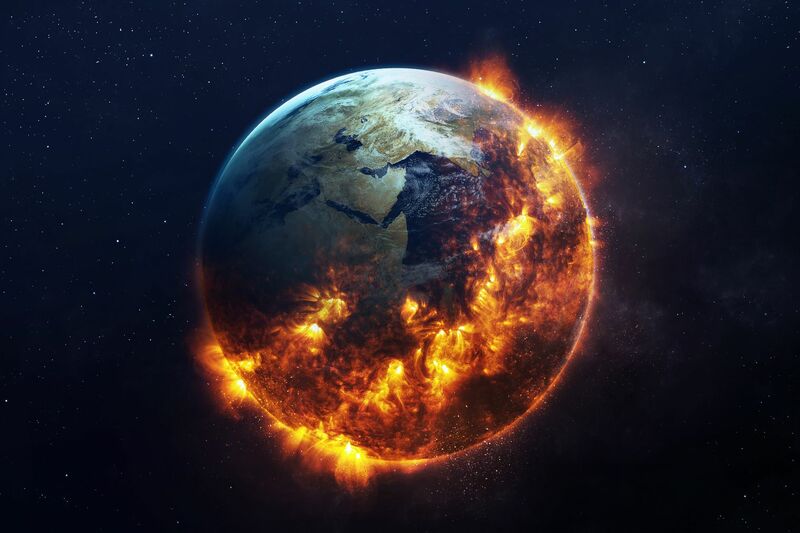 Scientists have long agreed that warming higher than 2 degrees will result in widespread food, water, weather, and sea level stresses, with concomitant immigration, conflict, and suffering, inequitably distributed. But 2 degrees is not some magic threshold where tolerable becomes dangerous. A two-year review of the latest science by the UNFCCC found that the difference between 1.5 and 2 degrees means heat extremes, water shortages, and falling crop yields. "The ‘guardrail’ concept, in which up to 2°C of warming is considered safe," the review concluded, "is inadequate." The report recommends that 2 degrees be seen instead as "an upper limit, a defense line that needs to be stringently defended, while less warming would be preferable." This changing understanding of 2 degrees matters, because the temperature target we choose, and the probability with which we aim to hit it, establishes our "carbon budget," i.e., the amount of CO2 we can still emit before blowing it. Many commonly used scenarios (including the International Energy Agency’s) are built around a 50 percent chance of hitting 2 degrees. But if 2 degrees is an "upper limit" and "less warming would be preferable," it seems we would want a higher than 50-50 chance of stopping short of it. This image should terrify you. It should be on billboards. 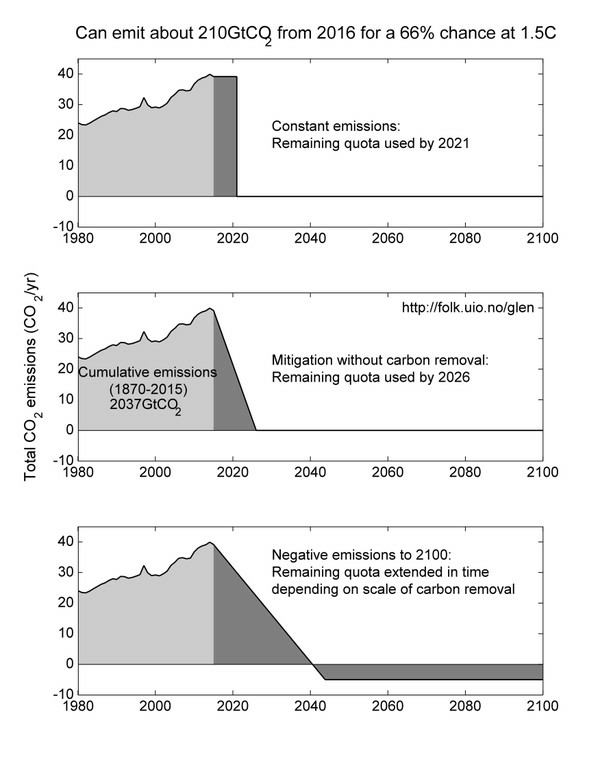 As you can see, in either scenario, global emissions must peak and begin declining immediately. 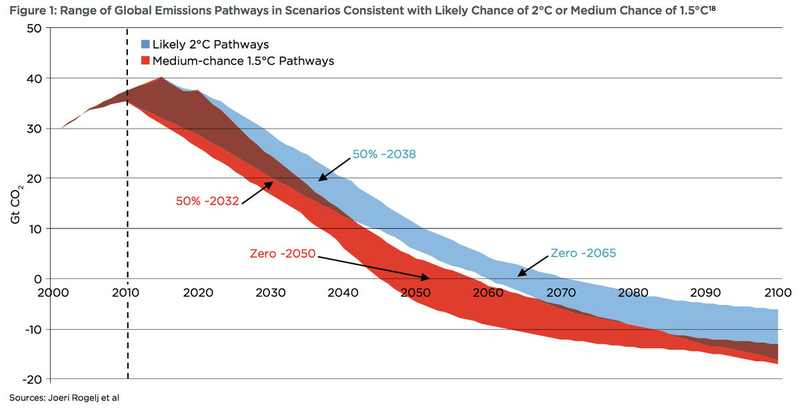 For a medium chance to avoid 1.5 degrees, the world has to zero out net carbon emissions by 2050 or so — for a good chance of avoiding 2 degrees, by around 2065. After that, emissions have to go negative. Humanity has to start burying a lot more carbon than it throws up into the atmosphere. There are several ways to sequester greenhouse gases, from reforestation to soil enrichment to cow backpacks, but the backbone of the envisioned negative emissions is BECCS, or bioenergy with carbon capture and sequestration. BECCS — raising, harvesting, and burning biomass for energy, while capturing and burying the carbon emissions — is unproven at scale. Thus far, most demonstration plants of any size attaching CCS to fossil fuel facilities have been over-budget disasters. What if we can’t rely on it? What if it never pans out? "If we want to avoid depending on unproven technology becoming available," the authors say, "emissions would need to be reduced even more rapidly." You could say that. This is from climate researcher Glen Peters, based on a scenario with a 66 percent chance of avoiding 1.5 degrees. Check out that middle graphic. If we really want to avoid 1.5 degrees, and we can’t rely on large-scale carbon sequestration, then the global community has to zero out its carbon emissions by 2026. There’s no happy win-win story about that scenario, no way to pull it off while continuing to live US lifestyles and growing the global economy every year. It would require immediate, radical shifts in behavior worldwide, especially among the wealthy — a period of voluntary austerity and contraction. That seems unlikely. So instead, let’s assume copious negative emissions technology will be available in the latter half of the century, just to give ourselves the most room possible. In those scenarios, how much of the world’s fossil fuels can we burn? How much more can we find and dig up? How do our carbon budgets compare with our fossil fuel reserves? 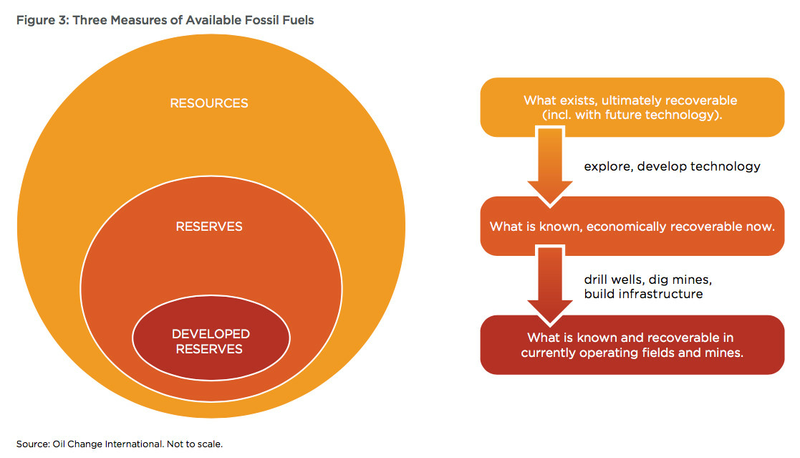 On the left is global developed fossil fuel reserves. Remember the terminology: That’s what we can likely get out of currently operating fields and mines. On the right are our carbon budgets, for the 2 degree and 1.5 degree scenarios respectively. 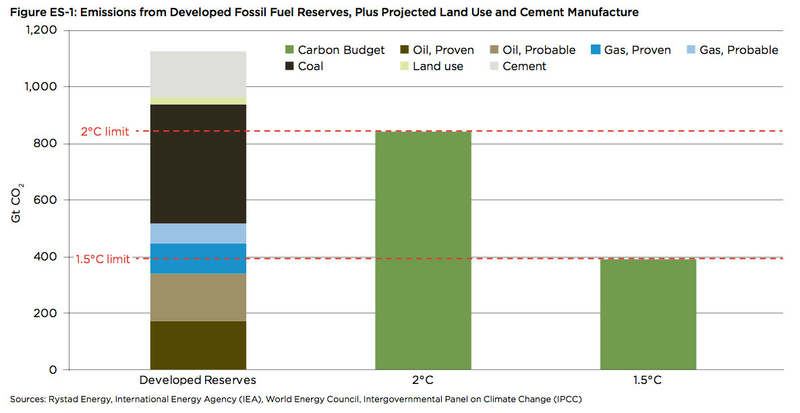 Existing developed reserves exceed the 2 degree budget, and oil and gas alone break the 1.5 degree budget. If we are serious about what we said in Paris, then no more exploring for new fossil fuels. No new mines, wells, or fossil fuel infrastructure. And rapid, managed decline in existing fossil fuels. An important note: The analysts at Oil Change assume that there will be BECCS from midcentury onward, but assume that CCS will not come online fast enough to substantially delay the decline of fossil fuels before then. Obviously, that assumption could be wrong on either end. CCS could develop faster than expected or turn out to be utterly impractical and too costly on any time scale. It’s too soon to know. What is clear is that we are betting our collective future on being able to bury millions of tons of carbon. It’s a huge and existentially risky bet — and maybe one out of a million people even know it’s being made. 1) In the event that massive carbon sequestration proves infeasible, avoiding dangerous climate change will require an immediate and precipitous decline in global carbon emissions over a decade or two. Given that most present-day economic activity is driven by fossil fuels, it would mean, at least temporarily, a net decline in economic activity. No one wants to discuss this. The sheer scale of the BECCS assumption underpinning the [Paris] Agreement is breathtaking – decades of ongoing planting and harvesting of energy crops over an area the size of one to three times that of India. At the same time the aviation industry anticipates fuelling its planes with bio-fuel, the shipping industry is seriously considering biomass to power its ships and the chemical sector sees biomass as a potential feedstock. And then there are 9 billion or so human mouths to feed. 3) The third option is to allow temperatures to rise 3 or even 4 degrees, which Anderson has called "incompatible with an organized global community." Such temperatures would bring suffering to hundreds of millions of people and substantially raise the probability of runaway global warming that can’t be stopped no matter what humans do. Runaway warming would, over the course of a century or so, serve to render the planet uninhabitable. Quite a legacy. All of these are desperate options. When climate activists say, "We have the technology; all we need is the political will," they act like that’s good news. But think about the political will we need: to immediately cease fossil fuel exploration, start shutting down coal mines, and put in place a plan for managed decline of the fossil fuel industry; to double or triple the global budget for clean energy research, development, and deployment; to transfer billions of dollars from wealthy countries to poorer ones, to protect them from climate impacts they are most vulnerable to but least responsible for; and quite possibly, if it comes to it, to limit the consumptive choices of the globe’s wealthiest and most carbon-intensive citizens. That level of political will is nowhere in evidence, in any country. So for now, it’s cognitive dissonance.